The Baby Walker as it names suggests does not necessary helps a baby acquire or develop walking skills. At first glance It looks like your baby has started walking but in actual fact it is just a simulation of walking. Upon closer inspection one can see that what it really does is allowing babies to walk on tiptoe at dizzying speeds. Walking on tiptoe requires them to tighten their heel and leg muscles group which is not the proper muscle groups needed for sitting, crawling and walking. Apart from interfering with the muscle development, part of the learning to walk process is visual, and involves babies watching how their feet and legs move. A baby walker usually comes with a tray which blocks the view of their legs they aren’t able to make a visual connection. Your baby needs to learn to roll, crawl, sit and to play on the floor, in order to reach their developmental milestones. Do you know that a baby in a walker can travel as fast as 1 meter per second, making a fall much more dangerous than if the baby was either walking or even running? Baby walkers are dangerous because they give babies extra speed, extra height, and access to many hazards. They are also unstable on uneven surfaces. In Canada, the sale of baby walkers is banned effective of April 7, 2004. Being in baby walker exposes them to a lot of potential danger and reports of injuries include skull fractures, broken limbs and laceration to fingers and toes. Most injuries are caused by falls when the baby walker tips,baby being thrown downstairs, or crashes into furniture, heaters, or ovens. 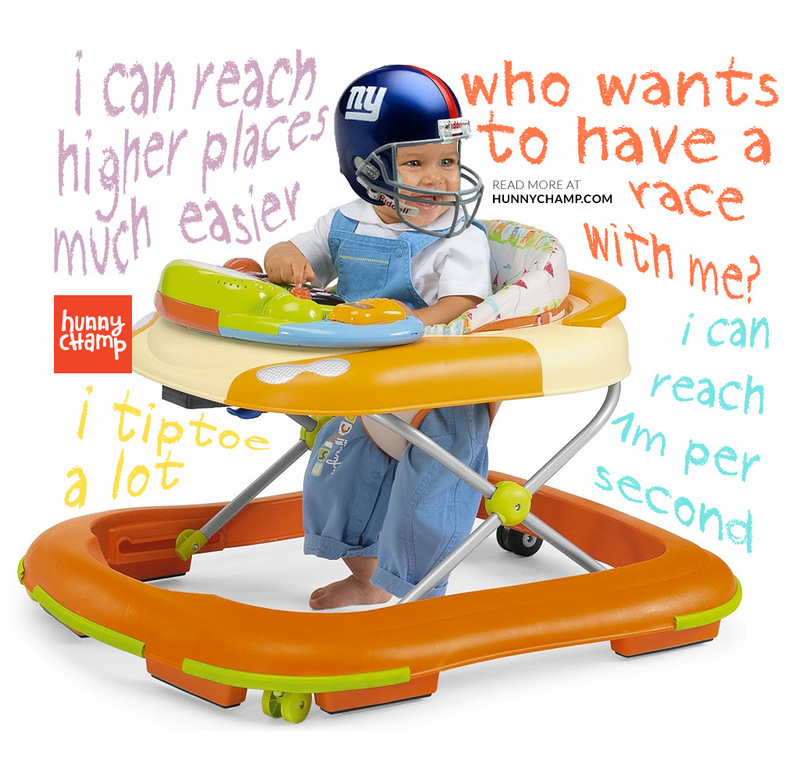 Use a newer model infant walker that meets safety standards. Safety standards require that baby walkers have a way to stop the walker at the edge of a step and a wide base so that they can’t fit through doorways. Use walkers only in rooms that have no access to stairs leading down. Don’t use one in upstairs rooms if the walker can fit through a door opening. Put baby gates at the top and bottom of stairs. Also use safety gates in front of forbidden rooms or areas. Safety gates that fasten to the wall are safer than the gates held against the wall by pressure. Gates do not prevent babies from tumbling down stairs in walkers. Children can take the gate down or the baby walker can knock the gate loose. Don’t use a walker around swimming pools and other water sources, unfamiliar pets, and roadways. Make sure any springs and hinges on the walker have protective coverings. Don’t carry a walker with your baby in it. It’s too easy for you to trip. Don’t leave your baby in a walker for extended periods. Short stints–less than 20 minutes–are best. If you insist on buying a walker, buy a new one. Used models are even riskier than new ones. One more thing, before you choose a child care facility, check to see if they use baby walkers. Make sure they have proper safety precautions in place, or better still, urge them to abandon the baby walker all together. A much safer and better option is to put your baby in a stationary activity center or a fenced up playmat area. This entry was posted in General, Safety and Health and tagged baby development, baby walker, safety.